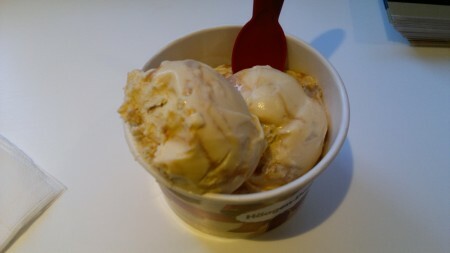 Last week, while in London, I made my usual pilgrimage to the Häagen-Dazs shop on Leicester Square to see what limited-release delights they had in store. I'm rather glad I did. Just the one "special" this time: Salted caramel flavour. Yes, Salted. Caramel. My auxiliary taster, who up till this point had maintained that it would be stupid to eat ice cream when it was so bitterly cold outside, changed her mind when given a taste. The flavour, as you would imagine, is just about the best caramel you've ever tasted, and every now and again you encounter a little crunchy nodule of caramelly fantasticness. It really is epically good. Words fail.